f="/articles/eng/Pre-Pottery_Neolithic_A" id="whe_lnki_189" title="Pre-Pottery Neolithic A">Pre-Pottery Neolithic A (8350 – 7370 BCE); sometimes it is called  The identity and number of the inhabitants (some sources say 2000–3000 dwellers) of Jericho during the PPN A period is still under debate, though it is known that they had domesticated emmer wheat, barley and pulses and hunted wild animals. Pre-Pottery Neolithic B, 7220 to 5850 BCE (but carbon-14-dates are few and early). Expanded range of domesticated plants. Possible domestication of sheep. Apparent cult involving the preservation of human skulls, with facial features reconstructed from plaster and eyes set with shells in some cases. During the Middle Bronze Age Jericho was a small prominent city of the Canaan region, reaching its greatest Bronze Age extent in the period from 1700 to 1550 BCE. It seems to have reflected the greater urbanization in the area at that time, and has been linked to the rise of the Maryannu, a class of chariot-using aristocrats linked to the rise of the Mitannite state to the north. Kathleen Kenyon reported “...the Middle Bronze Age is perhaps the most prosperous in the whole history of Kna'an. ... The defenses ... belong to a fairly advanced date in that period” and there was “a massive stone revetment... part of a complex system” of defenses (pp. 213–218). Bronze-age Jericho fell in the 16th century at the end of the Middle Bronze Age, the calibrated carbon remains from its City-IV destruction layer dating to 1617–1530 BCE. Notably this carbon dating c. 1573 BCE confirmed the accuracy of the stratigraphical dating c. 1550 by Kenyon. A synagogue dating to the late 6th or early 7th century CE was discovered in Jericho in 1936, and was named Shalom Al Yisrael Synagogue, or "peace unto Israel," after the central Hebrew motto in its mosaic floor. It was controlled by Israel after the Six Day War, but after the handover to Palestinian Authority control per the Oslo Accords, it has been a source of conflict. On the night of 12 October 2000, the synagogue was vandalized by Palestinians who burned holy books and relics and damaged the mosaic. ^ a b 2007 PCBS Census. 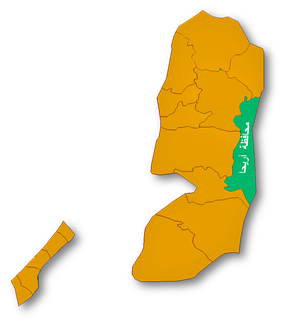 Palestinian Central Bureau of Statistics (PCBS). ^ Gates, Charles (2003). "Near Eastern, Egyptian, and Aegean Cities", Ancient Cities: The Archaeology of Urban Life in the Ancient Near East and Egypt, Greece and Rome. Routledge. p. 18. ^ "Bibliotheca Sacra 132". 1975. pp. 327–42. ^ Editors, Mandatory (24 January 2013). "travel, history, civilizations, greatest cities, largest cities, Jericho". Mandatory. Retrieved 12 March 2013. ^ Mithen, Steven (2006). After the ice: a global human history, 20,000-5000 BCE (1st Harvard University Press pbk. ed. ed.). Cambridge, Mass. : Harvard University Press. p. 57. ^ Mithen, Steven (2006). After the ice: a global human history, 20,000-5000 BCE (1st Harvard University Press pbk. ed. ed.). Cambridge, Mass. : Harvard University Press. p. 54. ^ a b Akkermans, Peter M. M; Schwartz, Glenn M. (2004). The Archaeology of Syria: From Complex Hunter-Gatherers to Early Urban Societies (c.16,000-300 BCE). Cambridge University Press. p. 57. ^ Mithen, Steven (2006). After the ice: a global human history, 20,000-5000 BCE (1st Harvard University Press pbk. ed. ed.). Cambridge, Mass. : Harvard University Press. p. 59. ^ a b c Thomas A. Holland (1997). "Jericho". In Eric M. Meyers. The Oxford Encyclopedia of Archaeology in the Near East. Oxford University Press. pp. 220–224. ^ Kathleen M. Kenyon (1957). Digging up Jericho: The Results of the Jericho Excavations, 1952-1956. New York: Praeger. p. 229. ^ Piotr Bienkowski (1986). Jericho in the Late Bronze Age. Warminster. pp. 120–125. ^ Bryant G. Wood (1990). "Did the Israelites conquer Jericho?". Biblical Archaeology Review 16 (2): 44–59. ^ William G. Dever (1990). "Letter". Biblical Archaeology Review 16 (5): 18. ^ Piotr Bienkowski (1990). "Jericho was destroyed in the Middle Bronze Age, not the Late Bronze Age". Biblical Archaeology Review 16 (5): 45–46, 69. ^ Bryant G. Wood (1990). "Dating Jericho's destruction: Bienkowski is wrong on all counts". Biblical Archaeology Review 16 (5): 45, 47–49, 68–69. ^ "A Blind Beggar Receives His Sight Luke 18:35". Biblegateway.com. Retrieved 31 March 2011. ^ "Jesus Heals Two Blind Beggars, Matthew 20:29". Biblegateway.com. Retrieved 31 March 2011. ^ “The Pilgrimage of Arculf in the Holy Land”, De Locis Sanctis as translated by Rev. James Rose MacPherson (W. London: BD. 24, Hanover Square, 1895), ch. I.11. ^ Graham, Peter. A Topographical Dictionary of Palestine. London, 1836. Page 122. ^ "Israel hit by fifth minor quake in a week". Bromiley, Geoffrey W. (1995). The International Standard Bible Encyclopedia: E-J. Wm. B. Eerdmans Publishing. Friling, Tuvia; Cummings, Ora (2005). Arrows in the Dark: David Ben-Gurion, the Yishuv Leadership, and Rescue Attempts During the Holocaust. University of Wisconsin Press. Holman (2006). Holman Illustrated Study Bible-HCSB: Holman Christian Standard Bible. Broadman & Holman Publishers. Janson, Horst Woldemar; Janson, Anthony F. (2003). History of Art: The Western Tradition. Losch, Richard R. (2005). The Uttermost Part of the Earth: A Guide to Places in the Bible. Wm. B. Eerdmans Publishing. Ring, Trudy; Salkin, Robert M.; Berney, K. A.; Schellinger, Paul E. (1994). International dictionary of historic places. Taylor & Francis. Scheller, William (1994). Amazing Archaeologists and Their Finds. The Oliver Press, Inc.
Schreiber, Mordecai; Schiff, Alvin I.; Klenicki, Leon (2003). The Shengold Jewish Encyclopedia. Schreiber Pub. *Frome June 2007 to June 2014, the Gaza Strip had been under de facto Hamas governance.